I'm not what one might refer to as "pleasant" company when I'm really hungry. Apparently this is an inherited trait. Honestly, sometimes I get so wrapped up in whatever I'm doing that hours (and hours!) go by before I've eaten a single, solitary thing. Then, suddenly, I'm famished. Like so famished that I start picturing myself in one of those insanely guilt-inducing commercials about starving children in Africa. You know the ones - where those doe-eyed children get like 10 grains of rice a day and have flies buzzing around their heads? Flies! Not good. Which is why I thought I'd share my go-to solution for situations such as these, as a Public Service Announcement of sorts. Ironically, the recipe involves rice. It also involves canned beans, avocado, lime, and scallions. What could be simpler? 1.) Pour undrained beans into a small saucepan & cook over medium heat. Add a few shakes of ground cumin & allow to cook until heated thoroughly, stirring occasionally. 2.) Meanwhile, prepare the scallions by thinly slicing both the white & green parts. Next, use a sharp knife to cube the avocado. Set both toppings aside. 4.) In the microwave, reheat prepared rice in a microwave-safe dish. 5.) 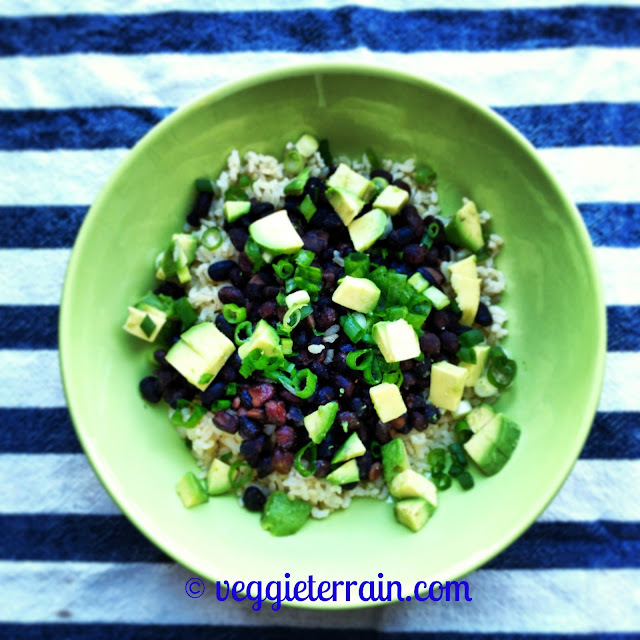 Spoon rice into a bowl & top it with several scoops of black beans, including some of the bean's liquid. Add avocado, scallions, & freshly-squeezed lime juice to the bowl. Eat as is, or add some sriracha if you're feeling extra spicy. What is this unpleasantness that you speak of when you're hungry? I won't hear it and I won't stand for it! hahaha This is the best PSA I ever tasted. Mmmmmm...so good! Somehow, I had a hunch you'd understand exactly what I was talking about... Glad you appreciated the PSA, babe! It's no fun being hangry. Love the addition of brown rice!